It was my visit to the second Goat Village, I am very impressed by the whole idea of self sustainable village and The Goat Village, Dayara Bugyal works with the same vision but also has something more to offer. It is a perfect destination for a peaceful hide out, where you can enjoy your own time, try the vegan food (my favourite), volunteer in the local farm, meditate, practise yoga and go for a hike too. Location: It is located on top of a village called Raithal, which makes it easier to locate and in case you need basic grocery products, it's just a walk away. Dayara Bugyal is located in Uttrakhand. It is 185kms from Dehradun, there is no direct public transport. To start your journey first you have take the overnight bus to reach Dehradun, then take a share cab to Uttarkashi. Most of the share cabs start in the morning around 6am from Football ground. Dehradun to Uttarkashi is a 5hrs drive. Once you reach Uttarkashi, you can take the local share cabs to reach Raithal village. The Goat Village is a 200m walk from the last stop. If you plan to drive by yourself, from Dehradun to Dayara Bugyal is 185kms and a 7-8hrs drive. Rooms: The cottages are as comfortable as it can be, with a magnificent view in the comfort of your bed. I really appreciate the cleanliness they maintain. Food (yes lets talk about that): Living a city life, I am literally sick of preserved and adulterated food. The vegan food with local recipes they serve are a treat to the taste buds and digestion. The Goat Village is well versed with sustainable models of farming, and implements them to create robust products which are selled by the Brand name Bakri Chaap. Service: We were hosted my the sweetest Pradeep and Priyanka. They were always a stone throw away and did everything to make sure our stay was comfortable. Highlight: Dayara Bugyal, is one of the largest meadows in India with a picturesque view. It is 8-9kms hike from The Goat Village, you can spend a night camping at the Bugyal. If informed in advance, The Goat Village team can help you plan and organise your hike. Dayara Bugyal Peaks are listed among the few largest and well known meadows in the Garhwal Himalayas. It is debated to be India’s most beautiful meadow. Dayara Bugyal hosts the unique butter festival, locally known as 'Anduri' sometime in the month of August or September, every year. The festival offers the visitors an opportunity to play Holi with butter, milk and 'Chacch' (butter milk) on the lush green high altitude meadow at around 11,000 feets in the Himalayas. · The route is mostly a gradual walk with a small section of steep ascent. Gangnani Sulphur Springs - Famous for its thermal water spring, Gannani, also known as Rishikund thirh, is a perfect place for meditation, rejuvenation and treat to nature lovers. A temple dedicated to sage Parasara, father of Veda Vyas lies in Gangnani. Its 23 kms from Raithal, almost 50 mins ride. Village Raithal is known for its rich agricultural and goat belts where people are still involved in the indigenous ways of living. 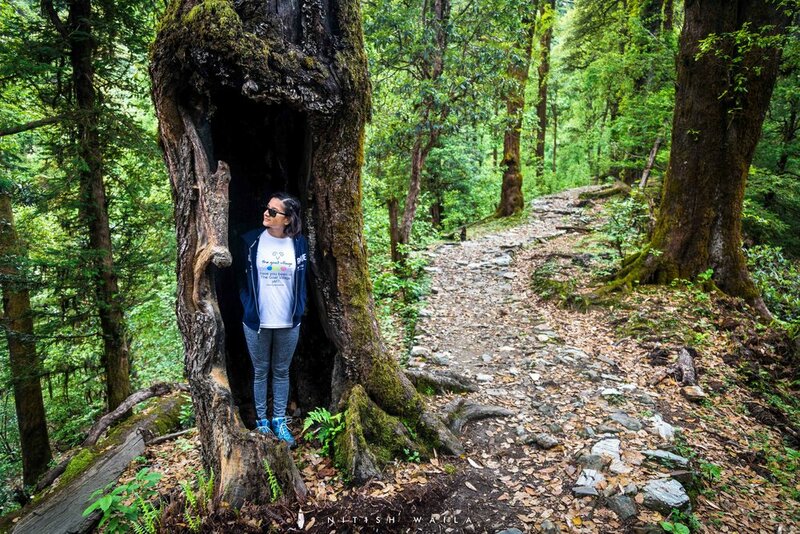 Get around to see more than 500-year- old houses and structures that still talk about the stories of how human civilization in the Himalayas has been like. You can take a photo tour in the neighbourhood and get to know the local way of living. Room Tip: Both the cottages are equally good and share the same view. For Bookings: http://thegoatvillage.com/ or you can get in touch with Mani Mahesh 8476033336. He can also guide you with directions and public transport.